One of the more popular sub-genres of crime fiction has always been the historical. Whether you are talking about legends like Barbara Peters and Lindsey Davis or more recent practitioners of the category such as Rhys Bowen and Susan Elia MacNeal, readers love to explore the past through tales of mystery and intrigue. Virtually every time period has already been explored, but still new authors are able to find uncharted ways to journey into the past. With her debut novel, The Secret Life of Anna Blanc, Jennifer Kincheloe has positioned herself as a new favorite among fans of historical mysteries. The Secret Life of Anna Blanc is set in 1907 Los Angeles. The novel – the first in a series – features Anna Blanc, an impetuous heroine readers will instantly fall in love with. Anna has the perfect balance of initiative and naivete to make any adventure she embarks on an interesting and unpredictable ride. She has a modern edge, while remaining true to the spirit of her era. As The Secret Life of Anna Blanc begins, Anna is running off to elope with her boyfriend. At every turn, things do not go as planned and soon she finds herself back at her father’s home – still single, but soon being courted by an unexpected admirer. Never one to settle for the easy path, Anna longs for a job as a detective – something that would be unheard of in 1907. Instead, she stumbles into a position as a police matron. These matrons were civilian women hired by the police department to act as liaisons between the male police officers and the women and children who might be involved in their cases. Anna gets off to a rough start with one of the men on the force and their banter provides endless enjoyment for readers as the tale moves forward. Anna’s first assignment causes her to uncover what could be a string of murders in the brothels around town. Since the victims are women – and prostitutes to boot – the police are not taking a very serious look at these crimes, but Anna will not let them off the hook that easy. By having Anna stand up for these undesirables, Kincheloe is further able to highlight the struggles of women during this time period – a theme which weaves its way through the entire novel. The plot of The Secret Life of Anna Blanc is as tightly wound as one of Anna’s elegant evening updos. It coils around itself, gaining strength and support from its well-laid foundation. And there are just enough loose tendrils – paths that lead to unexpected places and possibilities for future development – to intrigue readers not only throughout this adventure, but also in anticipation of future storylines avenues. 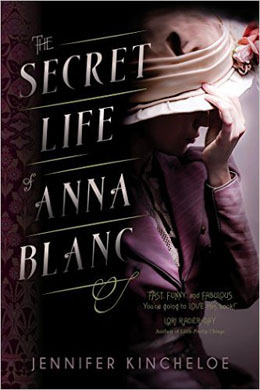 The Secret Life of Anna Blanc may be set in yesteryear, but Kincheloe’s writing is as fresh as the morning dew. Even the clever, period-appropriate curse words used by Anna Blanc become endearing. Don’t be surprised if you hear fans at the next Bouchercon screaming out “Biscuits!” or “Jumpin’ Jupiter!” throughout the halls of the conference hotel. Jennifer Kincheloe has created a winning heroine and has plunked her down in a fascinating time period – doing both with the skill and talent to bring everything to life for readers everywhere. I can’t wait to see you in New Orleans and yell “biscuits.” Great review! LOL. I can’t wait either!